One of the biggest issues when moving away from Windows is software availability; what we do on a computer isn’t defined by the operating system, but the third party software we use on that operating system. Because most of the software written for Linux operating systems is open source, it may be difficult to find a replacement for the everyday software that you use on Windows or Mac OS X. 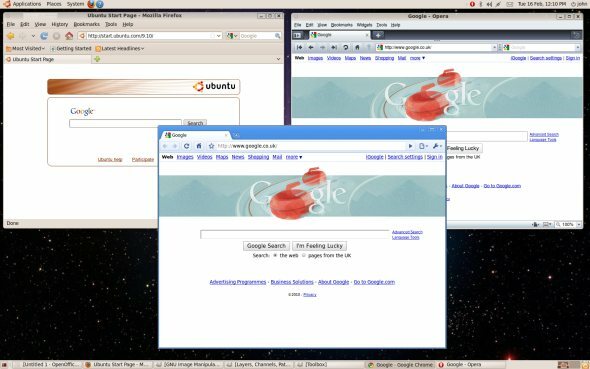 Everybody has their favourite browser, and you’ll find many available for Linux. I chose to use Firefox (which is installed on Ubuntu by default), Google Chrome (my browser of preference on Windows and OS X) and Opera 10 Browser in addition to this. When testing each browser, I found them to be on par with each other, although Opera was definitely slower than Firefox and Chrome. I found Chrome to be extremely fast and lightweight in comparison to Firefox, and it remains my browser of choice on Linux. If you make the switch, or already use Ubuntu, I definitely recommend checking Chrome out. Enabling Flash was also an easy process — I simply downloaded the plugin on first use and everything worked great. Also included in Ubuntu is Evolution Mail, an email client. Although it works great I definitely prefer Mozilla’s Thunderbird, a client I use daily with Windows and Mac OS X. Although it isn’t installed on Ubuntu by default, it’s included in the Ubuntu repository, so it can be easily installed either via a terminal command or the Ubuntu Software Centre which makes it simple to install software without any complications. I find it easier to install via the terminal, with a simple command that allows you to install software from the repository directly from terminal. All you have to do is type sudo apt-get install thunderbird and type in your user password to allow it to install. You’ll now find it under “Applications” > “Internet”. Once it’s installed it can be set up with your email account. If you’re coming from Windows, you’ll have no doubt used Microsoft Office rather religiously for some time now. If you want to, you can use Microsoft Office under Linux, or any Windows application, by using Crossover for Linux. 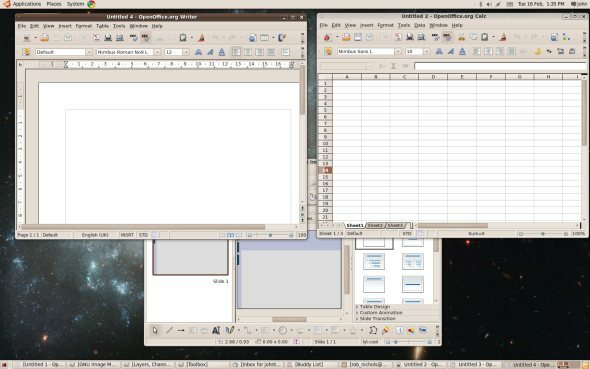 If you don’t want to buy Crossover or would prefer to use open source software, the best option is OpenOffice for Linux. Also available for Windows and OS X as an alternative to MS Office or iWork, OpenOffice is a free download although it’s included with Ubuntu 9.10 by default and can be accessed it via the applications menu. The bundled suite includes a Word Processor, Spreadsheet and Presentation application. I find these perfectly adequate for my needs, but if you need additional programs from the suite, such as the database application, these can also be downloaded. Most of my everyday computer use is based around my media. I often have iTunes 9 in the background whilst I work on a project or browse the web. I either download media via P2P or buy TV shows and music in iTunes and watch them after a day’s work. With so much dependence on commercial software, I highly doubted finding a suitable replacement. My first port of call was Rhythmbox Media Player, which had a lot of features that impressed me. I especially loved the Last.fm integration which I set up with my account to listen to my playlists through the player. I also enjoyed some of the internet Radio stations available through the program too. If your favourite internet radio station isn’t available, you can manually add additional feeds. There are also two stores available to download some music, but there simply isn’t enough content on them to warrant the name ‘store’. Granted, I could download music separately and import my existing library into Rhythmbox, and as a music player alone, Rhythmbox is certainly very capable and packs some features such as Last.fm integration that you wouldn’t even find in iTunes, but I missed the simplicity of iTunes when listening to my collection. On Windows and OS X, I watch most of my video content through VLC Media Player, which can handle almost any file format one can throw at it. Although it isn’t installed by default in Linux, it’s easily installed again through the terminal, using the same method as the Thunderbird install by typing sudo apt-get install vlc. Once it’s installed you’ll be able to find it in the ‘Sound & Video’ section of the Applications menu. One of the biggest complaints you’ll hear from Windows users about any other OS, be it Linux or Mac OS X, is the lack of games for these platforms. Contrary to popular belief, there are many games available for Linux and Ubuntu specifically. To go through every single option here would be impossible, but I’ve been playing quite a few in the past few days on Ubuntu, and found quite a few gems. Other games include a musical game, where you have to control a guitar with the keyboard as accurately as possible, called Frets On Fire. There’s even a flight simulator called Flight Gear. All of these I’ve mentioned are free, although there are also non-free games too, such as Doom 3 and Enemy Territory: Quake Wars available.